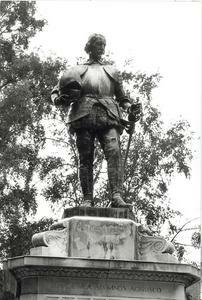 A bronze stature of Sir Philip Sidney in armour, mounted on a tall pedestal, holding his helmet in his right hand and his sword in his left. 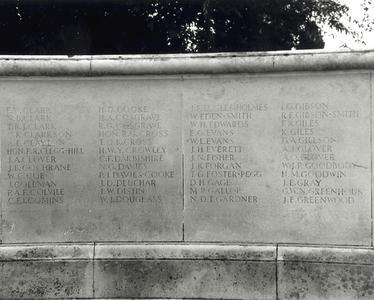 The names of the fallen from the First World War are carved in columns on two sides of the pedestal; the names of those killed in the Second World War are carved on a low concave wall which arcs behind the memorial. 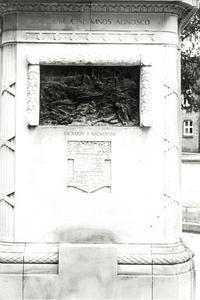 There are also bronze panels on the pedestal, depicting first a trench scene, and second Sir Philip Sidney's death at the Battle of Zutphen. 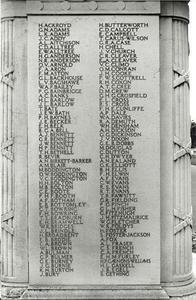 The school arms are on the pedestal in relief. 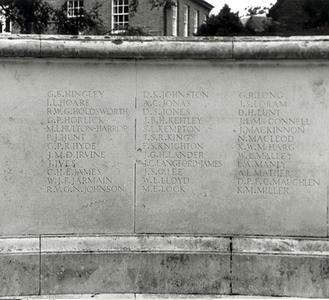 Comments: The funds raised after the Second World War amounted to around £15,000, but this money was largely used to pay for the education of the sons of Old Salopians at the school. 'Salopians in London: Annual Meeting', Wellington Journal & Shrewsbury News, 27 March 1920, p. 5. 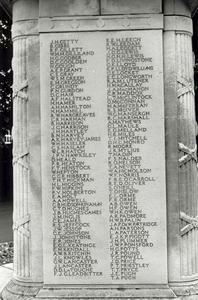 'Shrewsbury School War Memorial Plans', Wellington Journal & Shrewsbury News, 27 July 1946, p. 6. 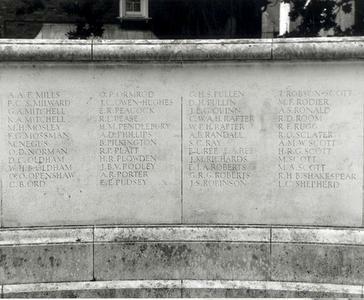 British Public Schools War Memorials, C F Kernot (1927), pp. 162-163. 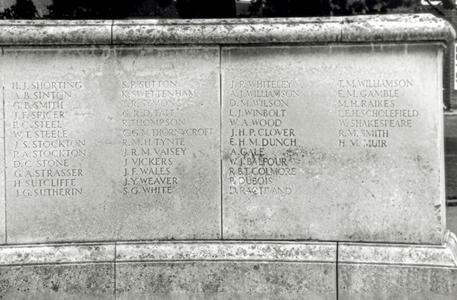 'Two Memorials at Shrewsbury School', Wellington Journal & Shrewsbury News, 26 May 1923, p. 7. 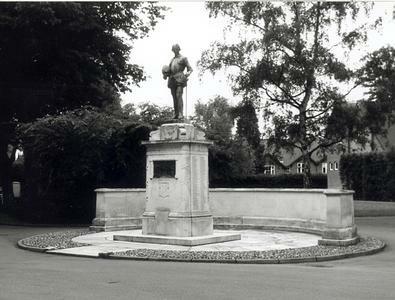 '...The war memorial is a life-sized stature of Sir Philip Sidney...', The Times, 25 May 1923, p. 9. 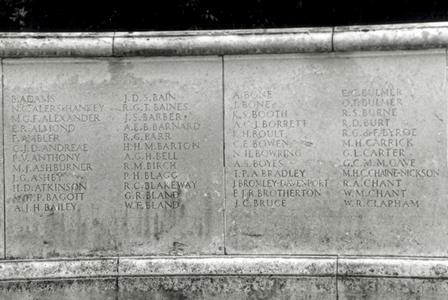 'Shrewsbury School War Memorial', Wellington Journal & Shrewsbury News, 25 March 1922, p. 12. 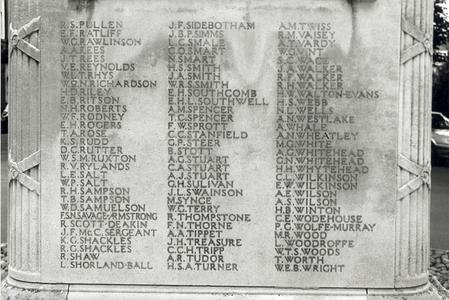 'Shrewsbury School: War Memorial', Wellington Journal & Shrewsbury News, 28 May 1921, p. 8.